Well, I went and did it. I bit the bullet and bought Battle for Azeroth, the newest expansion for World of Warcraft. I wasn’t planning to, as my last excursion into WoW was last year (maybe earlier this year) when I got through most of Legion, earned flying, and maxed out my Mage (and maybe my Priest’s?) artifact weapon. I got tired of the green-and-grey aesthetic of the demons, and never even finished the main story for the content patches after Argus was released. I had three max level characters, and a slew at various places between 80 and 110. And I honestly didn’t know if I was gonna be back. But here I am. Because I can’t escape the hype train that I am seeing all over Twitter and in both the Geek to Geek Discord server, as well as the Blaugust 2018 one. People there are so excited (despite the whole Burning of Teldrassil nerdrage going on in the various WoW communities) that I can’t not get excited, too. And after my last couple of months where I dealt with my mom’s cancer diagnosis and death by retreating into myself and fully beating 7 jRPGs in almost as many weeks (yeah, I know that’s nuts)…maybe this is a good thing. I can play with other people. I want to play with other people. I know that Joe of Geektitude is playing BFA, and I am probably gonna crash his party wherever he is in the world. I usually play on US-Malygos Alliance, but with my desire to be where my friends are…I may just start on a different server. And hey, I unlocked two of the new Allied Races so far (Highmountain Tauren and Nightborne), so I have some more options on Horde side. What’s also funny is that I totally have an on-again/off-again relationship with World of Warcraft. I recently stumbled across my post, 7 years after I started WoW, where I unsubscribed for the very first time and “quit” the game. For good. Yep. That worked out well. Here’s even a screenshot I posted with it where I melodramatically took a picture of my Priest 1 second before my “final logout”. And then I started it back up again. I got sick (with what turned out to be mono), and I resubbed to WoW during that time despite telling myself that I knew better. But it was during this time I tried Horde out for the first time and worked on getting my Druid his Stormrage set finally (I swapped to Priest during T2, so I never got it the right way). And then, even after that, I was celebrating my 10 Year Anniversary of playing the game, and the release of Warlords of Draenor. So you can see…I am very, very good at staying away from WoW. And not buying vanity pets…but you can cook on that tiny Ragnaros so that was totally worth it…ahem. 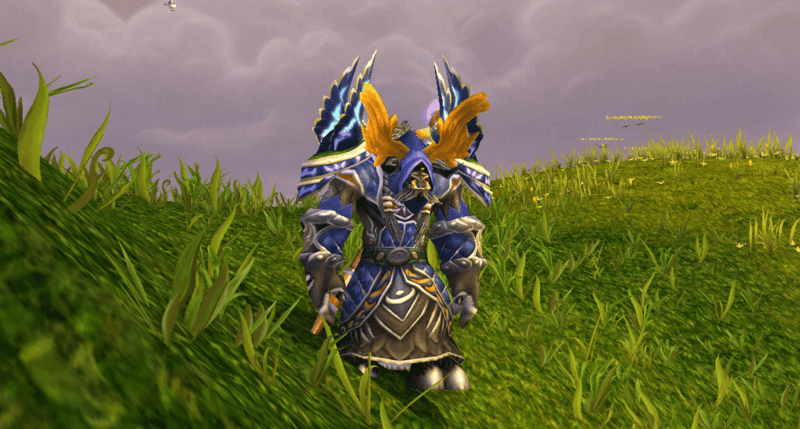 Now, here I am again, on the precipice of a new WoW expansion, looking over that fence and seeing that yes, the grass is certainly greener there. Who knows for how long it will be, but right now it is. So if you want to join me, hit me up on Discord. My tag is professorbeej#1337. Who knows if this time, I’ll be fighting for the Horde or the Alliance…or maybe both occasionally. Whatever the case, I know that I will be doing it with friends for the first time in a very, very, very long time. And that makes me more excited than any expansion content ever could. See ya in Azeroth, geeks!